Bill, age 65, and his wife Sue, age 62, are charitably minded, but are also interested in providing for their children through their estate. They currently have a highly appreciated asset they no longer need. If Bill and Sue create two types of trusts, they would be able to leverage their highly appreciated asset into two gifts – one for family and one for charity. Step 2: Bill and Sue irrevocably gift to the CRUT an asset valued at $1,000,000 with a cost basis of $200,000. Bill and Sue bypass capital gains when the trustee of the CRUT liquidates the asset and uses the proceeds to reinvest inside of the trust. Based on the highest capital gains tax rate of 23.8%, this saves $190,400 in capital gains tax. Bill and Sue receive a charitable income tax deduction the year of the gift. Based on an IRS discount rate of 2.4%, their deduction is $287,700. If they are in the 39.6% tax bracket, this saves $113,929 in federal income taxes. 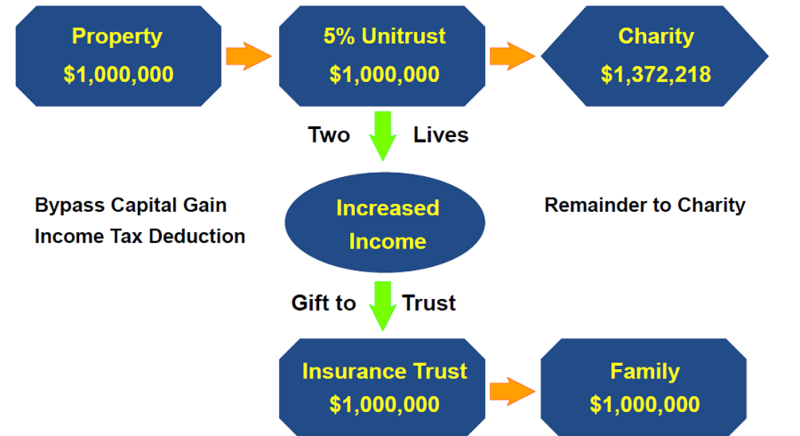 Step 3: Bill and Sue use part of the yearly income from the CRUT to make gifts to the ILIT, which the trustee will use to pay premiums on a life insurance policy owned by the ILIT on the lives of Bill and Sue. The death benefit on the policy equals the value of the asset transferred into the CRUT - $1,000,000. Bill and Sue’s children are the beneficiaries of the ILIT. After Bill and Sue pass away, the CRUT distributes its remainder to charity. Based an assumed growth rate inside the CRUT of 6%, the amount projected for charity will be over $1,000,000. In addition, the children, as beneficiaries of the ILIT, will receive $1,000,000 from the life insurance owned by the trust. By using a charitable remainder unitrust with an irrevocable life insurance trust, Bill and Sue leveraged a single asset to benefit both their family and their favorite charity. This is a hypothetical example for illustrative purposes only. The assumed growth rate inside of the CRUT is not based on any particular investment. Investments fluctuate and when redeemed, may be worth more or less than originally invested. Tax figures based on IRS rates effective June 2017. Life insurance products contain fees, such as mortality and expense charges (which may increase over time), and may contain restrictions, such as surrender periods.